So I encouraged Bob to bring out his supplies (of which there were many, and well organized) and he proceeded to show me how one ties flies. Bob highly recommends buying good materials if you're serious. As he shared, "You will find it really makes a difference. You really do get what you pay for." Bob ties trout flies as the Brook, Rainbow and Brown trout are prevalent in North Carolina and Tennessee where he fishes. 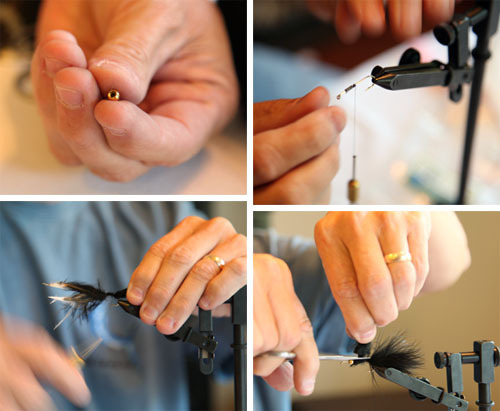 It became quickly apparent that fly tying is an art form. Each fly must look like the real deal, otherwise fish won't bite. Proportion is key when crafting your flies. Bob, "If you look closely at a fly you just tied and think 'something just doesn't look right,' you can bet the trout will be thinking the same thing." Bob showed me how to make a fly called the Bead Head Wooly Bugger. Materials he used for this fly included a #6 streamer hook, a 3/16 gold bead for the head, black thread, marabou feathers, copper wire, chenille, ribbing wire and head cement. Watching Bob tie flies, I realized this task requires much the same skills as fishing itself. Time, patience, skill, attention to detail and all five senses. 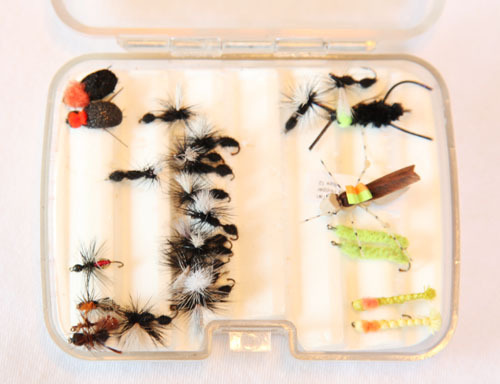 It's evident that fly tying is a very relaxing hobby and a fun one- as long as the fish bite. There's a lot of threading and winding round and round. Bob used the words 'clockwise,' 'counterclockwise,' 'hackle,' 'careful' a lot. I pretended I followed what he was doing but focused instead on taking pics of all the cute fake bugs. This pretty, colorful material is my new favorite fishing term, McFly Foam. Bob uses it to simulate real eggs. Bob, "One of the simplest trout flies isn't a fly at all. It's an egg." Bob finds that Brook trout especially love these... I would too, they're cute. These are Saddle Hackle feathers and Bob seems to use these a lot. 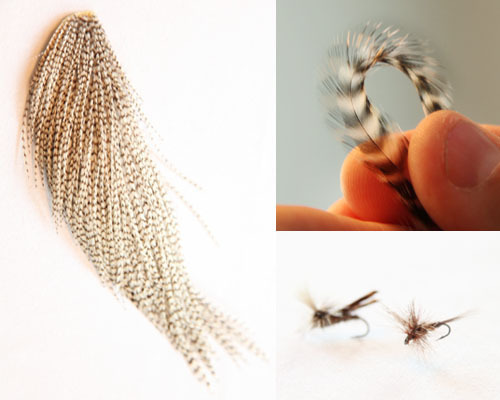 The hackle can keep a fly floating by allowing it to ride on the surface tension of the water. All the hard work pays off when there are moments such as this. When I asked Bob what it feels like for a fish to bite his handcrafted fly, he immediately smiled, "It's not a Man vs. Nature paradigm, but more of a Man one-with-nature experience. There is a certain serenity on a trout stream, a communion of sorts."